What’s the quickest way to place 42 coloured pegs in their appropriate holes? What are the Memory Doors for and what is the purpose of the spinning Peg Wheel? Peg Fast sounds simple but good thinking and fast working will make you the winners. Peg Fast is a race against the clock and your friends. Talk to your partners and work out a strategy. Race the group on the other side of the Peg Fast wall or go at your own pace. To place coloured pegs into four separate 10 meter long zig zagging walls. Children will need to solve logic and memory problems along the way e.g. open a series of small doors to find which door contains the correct coloured peg hole. Children can compete against other kids on the other walls or compete against the best time on the score board. Children are not required to stand on any apparatus to reach the peg holes. 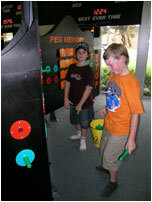 They are required to work their way along the length of each wall placing a peg in each specific hole until they have filled all the holes and completed the task. There are 4 identical Peg Fast Walls each catering for up to 6 children. The game is computer controlled so all holes must be filled and all tasks finished before you can stop the timer and hopefully win the game.